Dump trucks or production trucks are those that are used for transporting loose material such as sand, dirt, and gravel for construction. The typical dump truck is equipped with a hydraulically operated open box bed hinged at the rear, with the front being able to be lifted up to allow the contents to fall out on the ground at the site of delivery. Dump trucks come in many different configurations with each one specified to accomplish a specific task in the construction chain. 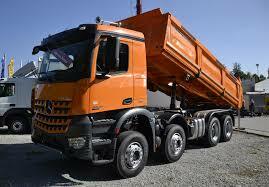 The standard dump truck is a full truck chassis with the dump body mounted onto the frame. The dump body is raised by a hydraulic ram lift that is mounted forward of the front bulkhead, normally between the truck cab and the dump body. The standard dump truck also has one front axle, and one or more rear axles which normally has dual wheels on each side. The common configurations for standard dump trucks include the six wheeler and ten wheeler. For the amount of noise made when transferring, the transfer dump truck is easy to recognize. It's a standard dump truck that pulls a separate trailer which can be loaded with sand, asphalt, gravel, dirt, etc. The B box or aggregate container on the trailer is powered by an electric motor and rides on wheels and rolls off of the trailer and into the main dump box. has a 3 axle tractor that pulls a 2 axle semi trailer. The advantage to having a semi end dump truck is rapid unloading. advantage of a semi bottom dump truck is the ability to lay material in a wind row. This type of truck is also maneuverable in reverse as well, unlike the double and triple trailer configurations. dump trucks allow the driver to lay material in wind rows without having to leave the cab or stop the truck. The biggest disadvantage is the difficulty in going in reverse. Side dump trucks consist of a 3 axle trailer pulling a 2 axle semi trailer. It offers hydraulic rams that tilt the dump body onto the side, which spills the material to the left or right side of the trailer. The biggest advantages with these types of dump trucks are that they allow rapid unloading and carry more weight than other dump trucks. 0 Response to "Types of Dump Trucks"